The purpose of the conference was to consider the theoretical and practical problems on sustainable water resources management in the region, application of innovative technologies for water savings and rational water use, improvement of operative data exchange in water allocations, improved management of transboundary water resources, last but not least the implementation of economic mechanism for water saving. The members of the Interstate Commission for Water Coordination of Central Asia (ICWC) from Kazakhstan, Tajikistan, Turkmenistan and Uzbekistan, representatives of Amudarya and Syrdarya Basin Water Organizations, Scientific вЂ“ Research Institute on Problems of Irrigation and Water Resources at TIIM, UNDP, GIZ, IWMI, CAREC, Embassy of Switzerland in Uzbekistan, Scientific вЂ“ Research Institutes, Design Institutes, Experts of Water Management organizations, Donor projects and students of TIIM have participated in the event. The plenary meeting was continued by the exposition on water saving technologies. 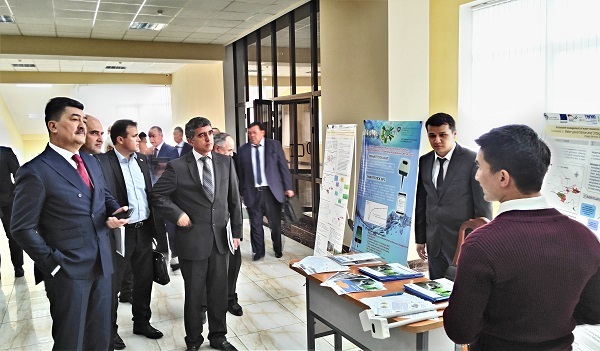 IWMI team took part in the conference and during the Exposition and has presented innovative technologies and research products implemented by IWMI projects in the region.